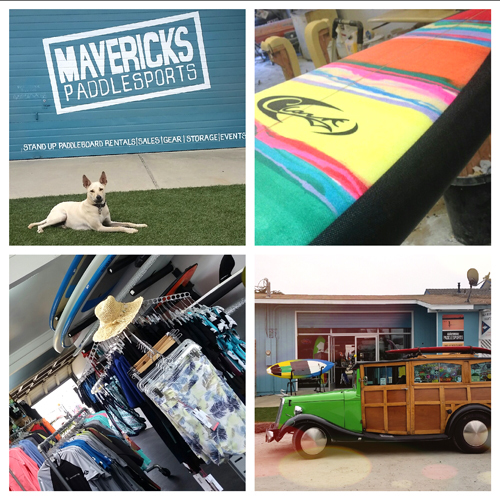 Mavericks PaddleSports is our newest shop dedicated to the fast-growing sport of Stand-Up Paddleboarding (SUP). Located on the calm, protecte d waters of Pillar Point Harbor, Mavericks PaddleSports is open to the public for SUP rentals, lessons, sales, classes, races, awesome SUP gear and clothing, SUP storage, and corporate & team building events. We are located at the Half Moon Bay Yacht Club in Princeton-be-the-Sea, just down the road from our flagship surf shop. Bring your boards or rent one of ours and just 50 feet to the calm waters of Pillar Point Harbor, the gateway to the Pacific Ocean and Mavericks. We have a wide range of paddleboards for sale whether you want to cruise flat water, race across open ocean, surf demanding waves or even surf the massive waves at Mavericks. We carry Jeff Clark Surfboards high performance, lightweight paddleboards for the most demanding conditions, as well as several other brands. Our full service shop also carries specialized gear, clothing and accessories for surf, SUP and water sports. Our facility includes a hot outdoor shower, comfortable changing rooms, lockers, picnic areas, fire pit and a welcoming staff that is here to provide the best customer service. Follow our Facebook Page for the latest news, photos and events. *Extended evening hours on Fridays and Saturdays during the summer and when we have special paddle events. We have a variety of boards for rent, whether you are new to the sport or an experienced paddler. Most of our rental boards are set for the beginning to intermediate paddler, with boards ranging from 9’2" to 10’6" with plenty of volume for easy cruising in the harbor. We also carry high performance surf SUPs, fun boards for paddling with kids and dogs, high performance race boards and downwinders. All rentals are subject to wind and weather conditions. Your rental includes the board, leash, paddle and life vest. Wetsuits are provided for $10 rental fee. Ask us about multiple day rental rates. Contact us for race day special pricing. Purchase 5 rentals for $100. This package is best if you rent often, or if you would like to try a variety of boards. This saves you $10 to $20 on rentals of our regular cruisers, surf or race boards. Does not apply for first time rental or to apply for a group rental. 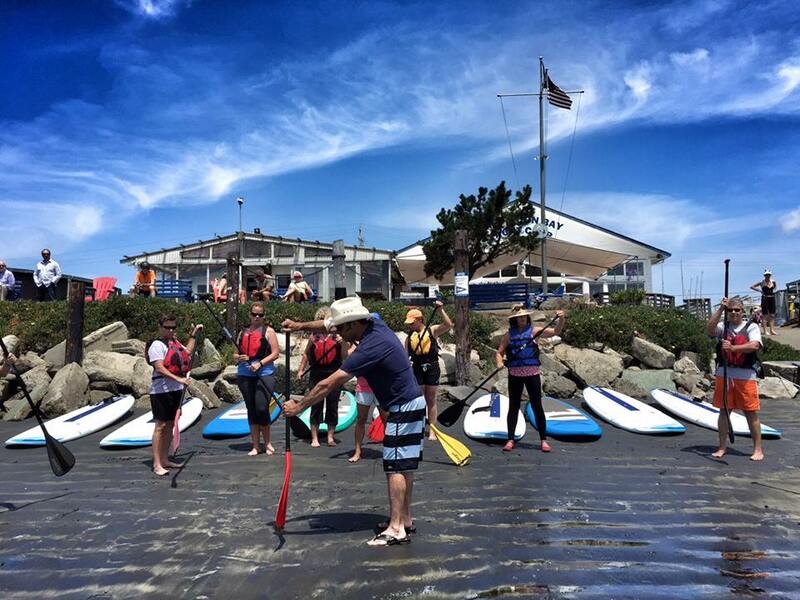 Stand-Up Paddleboard lessons take place just steps from our shop, on the calm waters of Pillar Point Harbor. For the more experienced paddler, a quick paddle across the harbor takes you to the Pacific Ocean, where open ocean adventures and amazing surf await. Check out our selection of lessons (detailed below). Give us a call at (650) 563-4251 and let us tailor the lesson to you or your group. 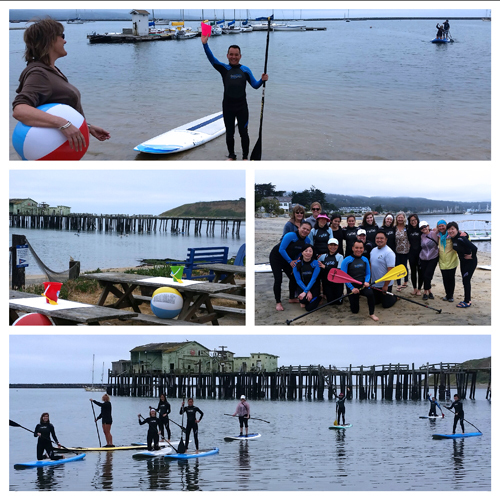 Book some time for yourself or a group to learn the basics of Stand Up Paddleboarding, including balance, safety and proper technique. The clinic designed to improve your stand up paddling skills, whether you’ve never paddled, paddled just once or want to improve your skills to get to the next level. More time is spent on improving your technique, responding to your environment, safety, turning, power strokes, and more. If you’ve been paddling for some time on your own, this is a great way to learn skills to practice and take your paddling to new levels. If you want to work with an experienced paddler to advance your skills on flat water, open ocean or in surf, this is the lesson you need. Working one-on-one, your instructor is trained to improve your biomechanics, agility and specific skills. We recommend you bring your own board, but we do have a variety of advanced boards to use during the session. SUP Yoga takes your yoga, stretching and strengthening to a new level! Challenge your skills while balancing on water on your board. Our experienced instructor will guide you through your paddle and poses for a truly unique and core-building experience. Our classes are offered on select Sundays throughout the summer and fall. We also offer classes by appointment for groups. Wouldn't it be great to cruise the harbor on your board with your best four-legged friend? 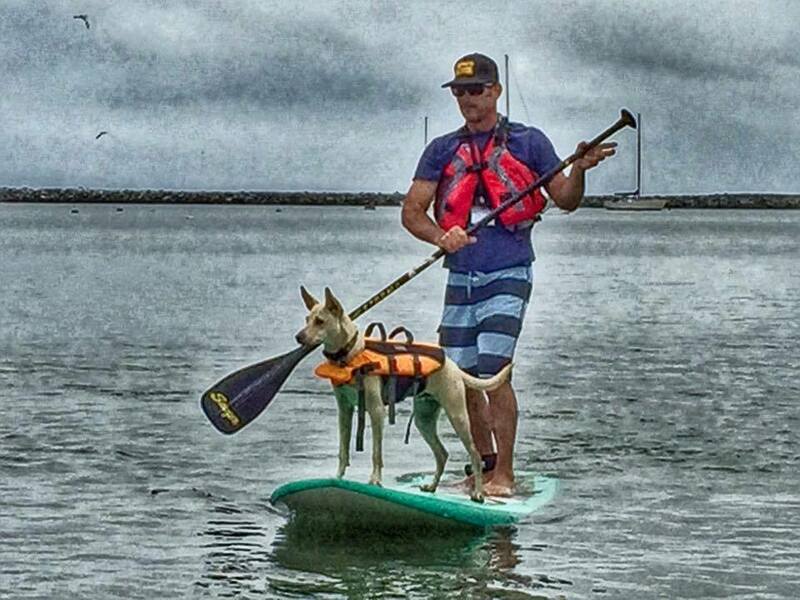 Our Sup with Your Pup class trains you and your dog to ride together on the board. Along with basic paddling skills, we go over safety techniques for you and your dog. Doggie life vests are required (and provided if needed). Watch our Facebook page for our next class, or book an appointment with our instructor. Note: some restrictions apply based on your dog's size and temperament. We’re here to help make your coastside experience a memorable one! Our staff can customize your group lesson or tour for anything from weddings, birthdays, treasure hunts, wildlife tours or even a "paddle and grub" tour. Contact us at (650) 563-4251 to explore unique ways to experience the rugged beauty of Half Moon Bay and the coast. It's a SUP, it's a raft, it's a whole lot of fun! Yes, we've got the GiantSUP ready for your group to take out and tour the harbor. 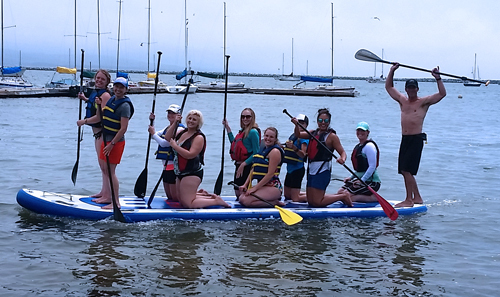 This is a great team-building tool, party rental or just a fun way for your group to get out and paddle. Ask us about special pricing for this rental or guided tour with a group leader. Join us every Friday night from June through November for our Friday Night Paddle Club! We set out for a paddle at 5 pm every Friday evening that conditions allow for a community paddle. This is a great way to meet fellow paddlers and learn new skills along the way. Our guide is there to assist, and participants can set off at their own pace or work in groups on specific skills, including racing, turning or simply cruising. Our support boat is on hand to assist as we set out on the harbor waters. Call to check current conditions. Drop-ins encouraged! This is Half Moon bay's unique SUP Yoga experience in beautiful Pillar Point Harbor. Our certified SUP Yoga instructor will guide the group through a calming yet exhilerating fitness experience on water. Bring your own board or use one of our boards to maximize your core strength. Classes run the second and fourth Sundays at 9:30 a.m. Additional group sessions are available by appointment. Call (650) 563-4251. Tired of schlepping your big board to the beach for a paddle session? Store your board with us and have 24-hour access right near the water’s edge. Rates start at $30 per month. Valet service is also available for those with storage for an additional $10 per use. Inquire about storage options. We can accommodate large groups, parties, corporate events and team-building workshops. 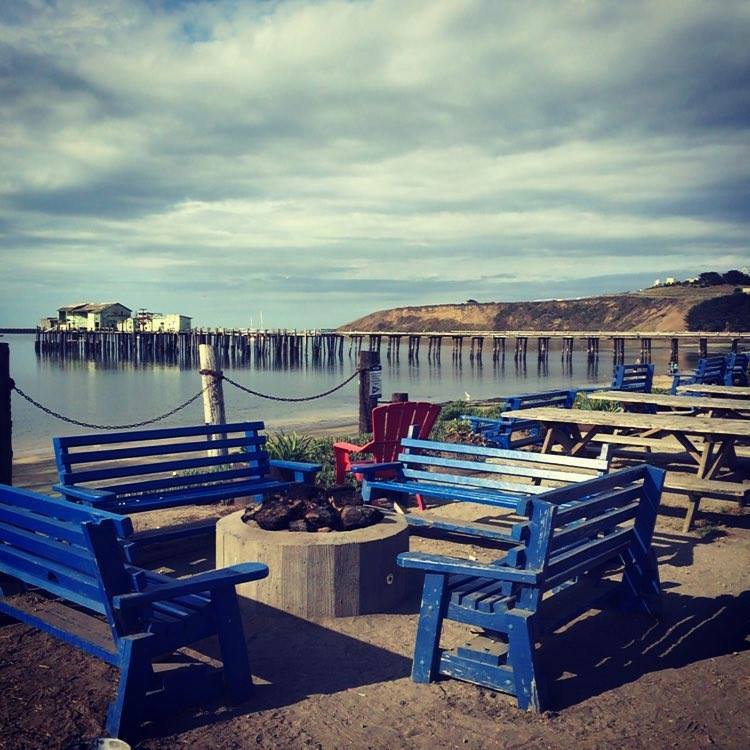 Looking to find activities in Half Moon Bay while in town? Give us a call and we can customize your experience! In addition to stand-up paddleboard activities, we have on-site meeting space for up to 120 people, as well as outside picnic seating, full kitchen, catering and bar service in association with the private Half Moon Bay Yacht Club. Our experienced staff will help your business create a unique meeting experience that includes activities on land and water. Looking for a guest speaker? Mavericks Pioneer Jeff Clark is a motivational speaker, sharing his experiences on and off the water and drawing parallels to personal and business goals. Give us a call to get you on the calendar early, and let us make this an unforgettable experience. Call us today at (650) 563-4251.